Get away from it all with your best friend by your side with our pet friendly vacation rentals. All homes and condos shown here allow one or more small pets. A $100 non-refundable pet fee applies to all pet friendly vacation rentals. If you can’t bear the thought of going on vacation without your furry friend, Anna Maria Island may be the ideal place for you to visit. Here we offer a number of exclusive pet friendly vacation rentals that provide you plenty of creature comforts and the option to bring your pet along with you. 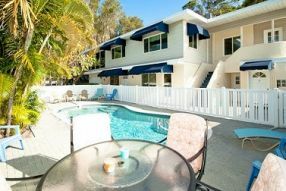 These rentals are located in some of the most highly sought after areas of Anna Maria Island, and you’ll be able to easily access the beach, shopping areas, bars, restaurants, and other attractions on the island. You and your pet will be living in luxury at these comfortable and spacious accommodations which cater to your needs and offer some impressive amenities. Options range from 2 bedroom/2 bathroom rentals that comfortably sleep 4 to 6 people up to larger luxurious homes with 4 or 5 bedrooms. These condos and homes are also often located close to the beach so that you can go for a quick relaxing beach walk or run with your pet. You’ll also find plenty of amenities that make you feel like you’re right at home. Typical options in these homes include stocked kitchens, spacious bathrooms, flat-screen televisions, wireless internet, dining and living rooms, washer and dryer, and more. You’ll be able to cook for your family and pet right in your rental with plenty of options to purchase fresh local produce and seafood nearby. Many of these rentals offer breathtaking ocean views as well. 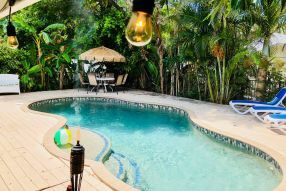 All it takes is $100 non-refundable pet fee and you can bring your pet along during your next trip to Anna Maria Island at any of these top tier rentals! 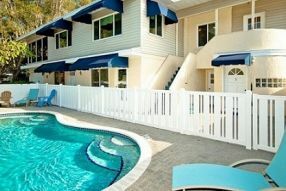 Click “More Details” on any of the listings for more information on each option or call us at (800)-237-2252 to reserve your pet friendly vacation rental today!